"Darling stop being philosophical it doesn't suit you, it is turning your nose red." In the magical world of Leonora Carrington, humans and animals change places, try on each other's outfits; it is a world where metamorphosis is a cinch. I should note here that Carrington often referred to herself as a "female human animal." The tree decorated with red berries and white lights lends Iguana and Fox a festive air. A half woman wearing the head of an iguana and a half man/ half fox regard each other over its ornamented top. Is that a plum pudding she offers in her left hand and a snowball she grasps in her right hand? This may be Carrington's version of regional Mexican folklore that she delighted in using in her work or it may be one of her own creations, a feminist archetype for our times. Leonora Carrington (1917 - 2011) was an English-born artist who made Mexico City her home. There she made a series of tapestries with assistance from an Aztec family of serape makers. Although best known for her surrealist paintings, Carrington was exposed to the beauty of woven cloth by her father, a successful textile maker. She is also credited as a founder of the women's liberation movement in Mexico. It is easy to dismiss surrealism as little more than a series of jokes with its pipes that are not pipes and its bowler hat-wearing gentlemen caught in incongruous situations but the traumas and the dislocations in the wake of the First World War (although no one knew it was only the first at the time) were enough to make a person refuse the reality that was given in favor of one that was self-created. 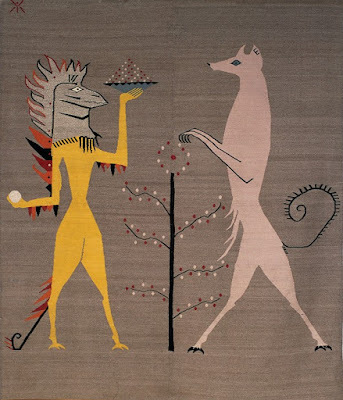 Leonora Carrington - Iguana and Fox - for Edward James, c.1948-1958, Estate of Leonora Carrington, NYC. It is good to be reminded that a Christmas tree can also be a humble sign of hope and joy. This photograph by the eminent American Walker Evans (1903-1975) is an instant color print and a fitting civic tribute to the joy that the beautiful evergreen fir tree conveys during this holiday season and throughout the winter. By the way, tannenbaum is the German word for fir tree. 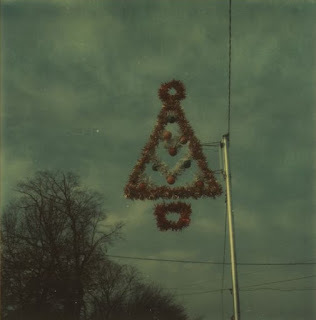 Walker Evans - Hanging Christmas Tree, 1973, Metropolitan Museum of Art, NYC. La grande vallee XIv, painted in 1983, comes closer than any other painting by Joan Mitchell that shows her affinity with Claude Monet. Like the Frenchman, who eliminated the horizon and the sky in his series of water lily paintings, Mitchell chose to orient her foliage paintings in an indeterminate space of her own construction. The longer we look at them, the harder it is to decide whether this is nature viewed close-up or viewed from a distance through half-closed eyes. Also, like Monet, she created mural-sized paintings of nature, no more or less abstracted than the Frenchman's nymphees. An inheritance from her mother in 1962 enabled Mitchell to purchase an old estate northwest of Paris. A large stone house was surrounded by two acres of gardens and trees with a view a the Seine. The romance of the site was enhanced by other small structures on the property; Claude Monet had lived in one from 1878 to 1881. Mitchell made a studio for herself in one that had a lookout over the water. 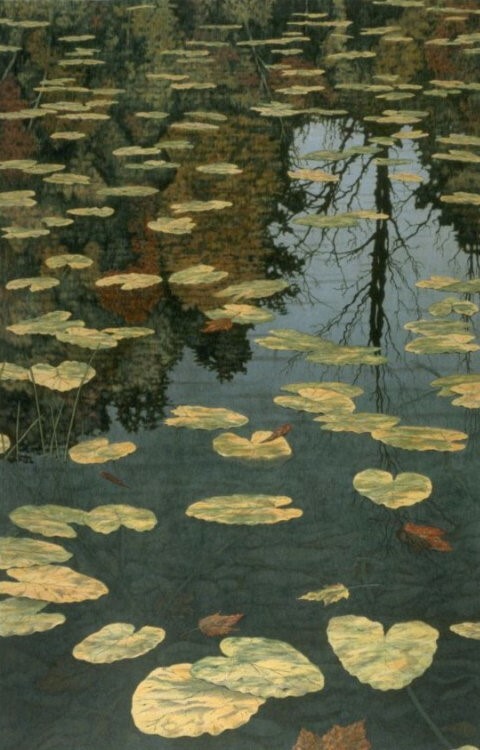 "I became the sunflower, the lake, the tree," Mitchell told Juidth Bernstock. Originally Mitchell moved to France when she began a relationship with French abstract painter Jean-Paul Riopelle. The relationship lasted from 1955 until 1979 but was far from harmonious. Riopelle was already married and the father of two young daughters. He was also France's pre-eminent abstract artist, something that must have chafed at Mitchell, a superior painter in every way, who found herself demoted to the status of 'artist's wife', a humiliation similar to that suffered by Lee Krasner when she was married to Jackson Pollock. Looking at Riopelle's work today it is hard to believe his imitations of abstract expressionism awed the French public. The most charitable interpretation I can make is that the French had not yet had many opportunities to see what the Americans were doing after World War II. Unlike many of her fellow abstract painters who denied any resemblances between their pictures and the natural world, Mitchell occasionally hinted at just such a connection. It was those moments when she experienced "supernatural states of soul" that drew her to the luminous landscapes of the French Impressionists. The affectionate mood that permeates Tilleul (The Linden Tree) is an intimate portrait of a tree, one that produces exquisite lime blossom tea. Broad strokes of cobalt and inky black alternate with shafts of chartreuse seen through a lavender haze. Are Mitchell's paintings abstract landscapes or some specially lyrical abstraction? Does it really matter to their success? I think not. Joan Mitchell was forty-seven before she had her first solo museum exhibition at the Everson Museum in Syracuse in 1972. "My Five Years in the Country" based on works she had done at her home Vetheuil, France preceded her solo exhibition at the Whitney Museum by two years even though Mitchell had lived in New York City since 1949 and participated in the landmark show "Ninth Street Show" in 1951 with Willem de Kooning, Hans Hoffmann, and Jackson Pollock. In her final years Mitchell continued to work on her large canvases, several of which are now in the Musee nationale d'art moderne at the Pompidou Center in Paris. despite undergoing two surgeries for advanced cancer. She died on October 30, 1992 at her home in Vetheuil at age sixty-seven. 1. Joan Mitchell - La grande vallee XIV, 1983, 2.8 m x 6 m, Pompidou Center Paris. 2. 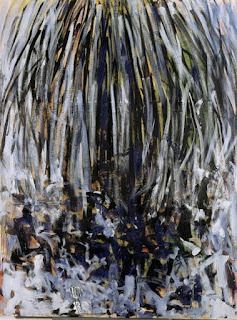 Joan Mitchell - Tilleul (Linden Tree), 1976, 2.4 m x 1.8 m, Pompidou Center, Paris. 3. Joan Mitchell -The good-bye door, 1980, 2.8 m x 7.2 m, Pompidou Center, Paris. A plane crashes into your boudoir? These things happen. A girl needs to finish her makeup before she greets the day; this is hard-boiled. A school girl's riddle from my mother's high school days goes like this: why do males disappear before Thanksgiving and only reappear after New Year's? If you have heard this one, know the answer, and smile ruefully, then you are hard-boiled. The hard-boiled attitude was first sited in Manhattan, post-World War I, when New York became the first truly sophisticated American city and a mecca for women looking for personal freedom. Before the New Yorker was founded in 1925, the Canadian Stephen Leacock had wondered in the pages of Vanity Fair (1915) "Are the Rich Happy?" A difficult question to answer, he discovered as he had trouble finding them. "Very often I have thought that I had found them, but it turned out that it was not so. They were not rich at all. They were quite poor. They were hard-up. They were pressed for money. They didn't know where to turn for ten thousand dollars." When Dorothy Rothschild Parker, as she was then known, began to appear in the pages of Vanity Fair it was with a series she called "Hate Poems," verses on a variety of subjects written in what came to epitomize the satirical attitude of the newly emancipated young woman. Office life, actresses, poseurs, retrograde relatives and, of course, men all came under her withering gaze. Although only twenty-three in 1916, Parker was herself already a walking anthology of sharp edges. "Husbands" in her words were "The White Woman's Burden," concluding "I wish to Heaven someone would alienate their affections." It was not until 1926 that Frances Newman from Georgia published a novel titled The Hard-Boiled Virgin. Her second novel Dead Lovers are Faithful Lovers was published two years later. It was the titles that seduced me when I discovered Newman's books in college. What I found was a neglected literary modernist whose layer cake of time and space was a bit like Virginia Woolf, and a writer whose use of interior monologue rather than dialogue to move her plots along, was a bit like Dorothy Richardson's multi-volume bildungsroman, Pilgrimage, begun in 1915. The daughter of a prominent Atlanta judge, Newman was educated in finishing school, in anticipation of a genteel career as a librarian. But Paris and the Sorbonne changed her mind. Newman finished writing her first novel at twenty-three but was never able to get it published. Undeterred, she kept writing and when The Hard-Boiled Virgin was published it was hailed by the eminent critic James Branch Cabell as "brilliant" for its portrayal of a young woman who chooses independence over marriage. Two years later when Dead Lovers are Faithful Lovers appeared it caused a scandal; Atlantans were outraged to find southern misogyny and racism personified in an angelic wife bested by a seductive other woman. When Newman died at forty-five, the guardians of morality in literature were happy to forget her. Deborah Garrison is a working girl for our time and if we thought the hard-boiled attitude was outdated, consider that the poems in A Working Girl Cant't Win have been characterized as "blatantly honest." 1. Bohemians, Bootleggers, Flappers, & Swells: The Best of Early Vanity Fair edited by Graydon Carter, Penguin Press, New York: 2014. 2. Deborah Garrison - A Working Girl Cant't Win, New York, Random House: 1998. 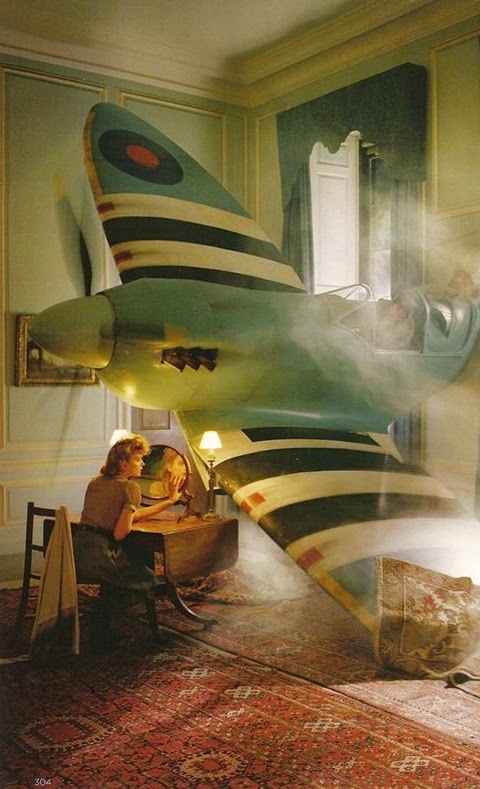 Tim Walker - untitled, from Vogue, UK edition: 2014. Against a neutral background of negative space, yellows, oranges, and purples vie for prominence in Colors of Autumn by Mercedes Matter. The abstraction of the image allows us to contemplate changes that the season brings. The intense colors that transforms leaves just before they dry up and drop from the trees in temperate regions are rivaled by the drama of autumnal sunsets, purple clouds back-lit by cherry pink skies. As the daughter of a famous modernist, Matter understood the expressive possibilities of abstract painting in the mid-1930s, years and a war before the general public had any inkling that the movement would take over the art world, drawing all the oxygen from other types of art for more than a decade. Just what is being abstracted in paintings known as Abstract Expressionist? Thoughts and emotions, filtered through a recognition that a flat two dimensional representation of three dimensions is intrinsically abstract. Renaissance perspective is, at bottom, just another abstraction. Those who met Mercedes Matter (1913-2001) described her as "elegant" and even "infuriatingly chic." And did I forget to mention "charming, intelligent, talented, and witty"? By the time she was twenty-three Mercedes Carles had an established artist as lover, Armenian expatriate Arshile Gorky. The next year she began to take classes with Hans Hoffmann, another expatriate artist who had just opened his own art school in New York City and who would be an influential teacher of dozens of abstract painters, including Mercedes Carles. Hoffmann also followed Gorky in her affections. Arthur B. Carles, who had studied painting with Matisse was her father and Mercedes de Cordoba. an artist's model who worked with Edward Steichen was her mother. Thanks to her parents, Mercedes met seemingly everyone in the art world while she was growing up. Born in Philadelphia, Mercedes received her first paintbox before attending finishing schools on two continents. She said that the museums and churches of Italy were her first art school. 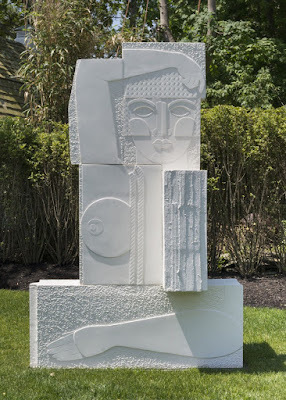 She met Herbert Matter while she and Bill de Kooning worked together on a mural project for the WPA with Fernand Leger; Mercedes also translated for the Frenchman. Mercedes became friends with Leger who, in turn, introduced her to his friend Matter, a Swiss photographer. The couple married in 1941. By the mid-1950s, Mercedes was, as Mary Gabriel described her in Ninth Street Women, "the opposite of a retiring wife." Along the way, she had affairs with fello w artists including Philip Guston. Mercedes Matter - Autumn Still Life, 1985, Mark Borghi Fine Art, NYC. When I was six years old I was given a book on world geography for my birthday. Through it I discovered the existence of volcanoes, something so much at odds with what I knew of the familiar terrain of northeastern New Jersey that I balked at the revelation. I couldn't think through this information and so I began to imagine that volcanoes could erupt anywhere at anytime. I worried over the smallest hillocks to the point that my parents had to flash a light over my backyard sandbox each evening that spring to assure me that no eruptions were sneaking up on Brookwood Road. Only with time did I realize that my reaction was part of a long history of humanity's attempt to wrestle with the inexplicable. Volcanoes are older than humanity, their eruptions are awe-inspiring displays of terrestrial outrage, yet, paradoxically, it is their effluvia that carry the minerals that enrich the surrounding soil and make human agriculture possible. Catal Huyuk, thought to be the first human city, flourished in Anatolia (now eastern Turkey) around 7000 BCE on a volcanic plain. The perturbations of Mount Etna (Sicily) and Vesuvius (Naples) and their lesser siblings cast a spell over classical mythology, among the earliest recorded literature. The Tale of the Bamboo Cutter, from 10th century Japan tells of a goddess who buries the elixir of life at Fuji's peak, hymns the perfection of its symmetry. In a neat bit of irony, only men were allowed to ascend to the top where its spectacular views could nourish the spirit. Mountain climbing is a form of spiritual pilgrimage for the Shinto believer and Buddhism also affirms similar intimations of immortality . Katsushika Hokusai's album Thirty-Six Views of Mount Fuji (c.1830-1832) was the first to spread the image of the sacred mountain beyond Japan. Not to be outdone, Ando Hiroshige also published his Thirty-Six Views in 1858. By the early 1890s the mountain was so well known that the public was ready for Yoshitoshi's tongue-in-cheek parody Thirty-Six Bizarre Selections of Transformation. With hindsight, Yoshitoshi, whose career bridged the end of the Edo Period and the beginning of the Meiji Restoration, stands as the last great Japanese master of the woodblock (ukiyo-e) print. Serena Perrone's A Volcano Pilgrim in Exchange for Fire is a contemporary series of 21 prints that align to form a continuous work some 25 feet long. Recognizable accuracy of individual volcanoes is blended at the edges of each with an otherworldly license made possible through abstraction. In Japanese ukiyo-e refers to an imaginary floating world and Perrone's series melds into its own floating world. The individual prints show active volcanoes in Italy, Central and South America and, most recognizably, Mount Fuji. 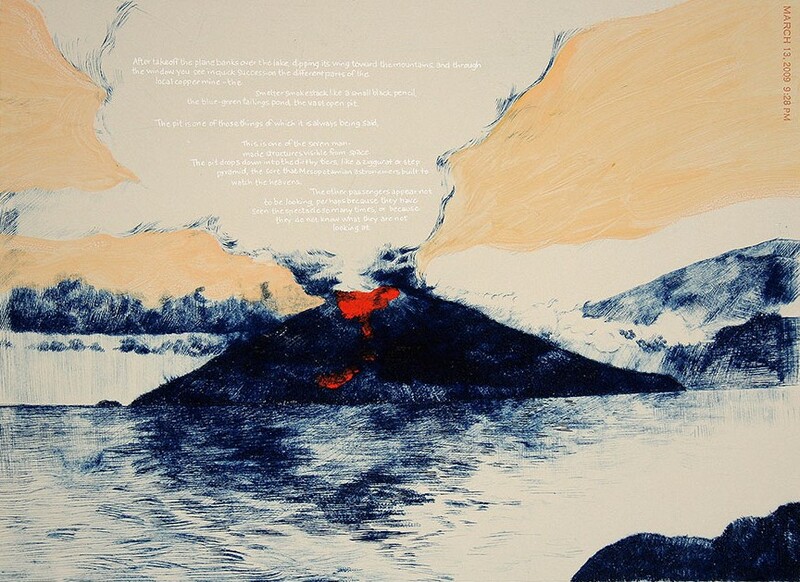 The spume blowing from each volcano contains bits of text taken from a travel blog written by poet Craig Arnold during the days preceding his death in 2009. Arnold was hiking and doing research for a book of poetry he was working on which was to have been called An Exchange for Fire. Arnold (b. 1967) and a winner of a Yale Younger Poets Award for his first book published in 1999. He disappeared while exploring the volcanic island Kuchinoerabujima in the China Sea off southern Japan on April 27, 2009. His body was never found and Arnold was presumed to have fallen to his death. Perrone describes her intention for this hybrid of images and text: "Moving geographically from Italy to Japan as they move chronologically through time from his first blog post to his last, the 20 prints in this series chronicle the 20 days on which he wrote during his Japan expedition." She hopes that her prints, by finding a permanent home at the Metropolitan Museum "will be enjoyed by generations to come, and the words of Craig Arnold will continue to reach new audiences." Serena Perrone is Assistant Professor of Printmaking and Drawing at the Pratt/ Munson-Williams-Proctor Art Institute in Utica, NY. 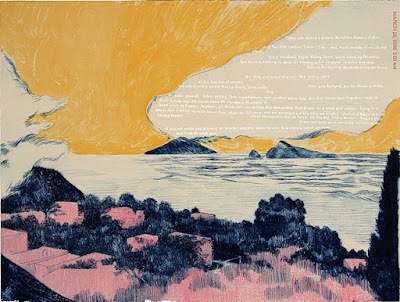 Serene Perrone - from he series A Volcano Pilgrim in Exchange for Fire, c.2009-2010 - dry-point, gouache, monotype and letter press on paper, Metropolitan Museum of Art, NYC. Growing up in Martinez, an old city in the East Bay area near San Francisco, early on LaBrie became keenly attuned to an element of decline in the changes taking place in the natural world. His first painting, made at the age of eight, showed the Yosemite Valley reflected in the Merced River. After studying art at the University of California, La Brie has described sketching his way around Europe and North Africa for a year before settling once again in California. A printing process that is based on the incompatibility of oil and water, that old cliche, is color lithography. Designs are drawn on prepared plates using greasy crayons or inks and when moisture is applied to the plate it adheres only to the uncovered areas. In the history of printing, color lithography is a relative newcomer, having been invented in 1798. Its predecessor, relief printing, as its name implies, is accomplished by incising a design into the surface of a pla te and then applying ink to it. It was first used by the Egyptians before the Common Era some two thousand years ago to print on cloth and spread rapidly after the invention of the printing press in the 15th century. A painstaking hand-driven process was mightily helped by the invention of photography in the 1820s; the introduction of halftones allowed an image to be broken down into a variety of sizes of dots. Changes in the composition of plates from limestone to pre-sensitized plates in 1951 have made ever more detailed and sublte effects possible for the accomplished artist. Louis LaBrie - Autumn, 1985, color lithograph, Fine Arts Museum of San Francisco. When Daniel Henry Kahnweiler decreed that great artists make art dealers great he was being disingenuous. The German-born French art dealer not only represented Picasso, Braque and Juan Gris from his gallery in Paris, he told the public what to think about Cubism at a time when the public didn't know what to make of this art that flirted with abstraction. In his book My Galleries and Painters, Kahnweiler underlined the continuity he found between Cubism and previous art. 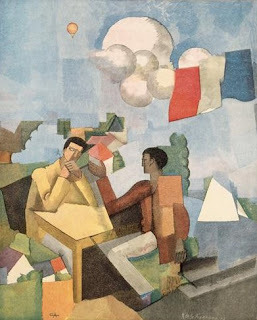 Roger de la Fresnaye (1885-1925) studied at the best art schools Paris had to offer, first the Academie Julian, then the Ecole des Beaux-Arts and finally at Academie Ranson, an outpost of the Nagis( Hebrew for Prophet) where he came under the influence of Maurice Denis, a strong influence on the contemporary American painter Alex Katz. Time spent in Munich where Expressionism's bright colors were the new thing gave him the palette that he would use so effectively in his paintings. La Fresynaye's Cubism was a playful thing, nothing deadly serious about it. Unlike his more famous confreres at the Daniel Kahnweiler Gallery, La Fresnaye was not on fire to overthrow conventional perspective as hadnde down to students have ever since the time of Leon Batiste Alberti in the 15th century. And as for abstraction, it interested him not at all. One of La Fresnaye's best known paintings The Conquest of the Air celebrates French achievements in defying gravity. The hot air balloon launched by the Montgolfier Brothers in 1783 was greeted with wonder by the public no less than Henri Fabre's 1910 flight, the first in a sea plane offshore of Marseilles. The French were giddy about the possibilities of human flight; they hosted the first International Aeronautic and Space Exposition in Paris in 1909. We know the neutral colors favored by Picasso, Braque, and Gris were inspired by their infatuation with early movies. Arne Glimcher, founder of the Pace Gallery New York City, and Bernice Rose. curator, revealed that story in their 2010 documentary Picasso and Braque Go to the Movies. 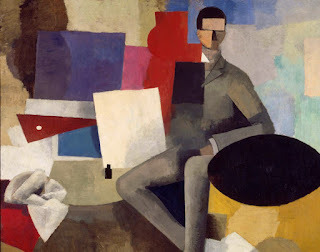 Even though La Fresnaye sometimes made use of subdued colors his fractured planes had a joyous aspect; in The Prestidigitator they convey magician's delight in his slight of hand. Fragile health shadowed La Fresnaye 's life from the time he had pleurisy in 1905 and again when he was discharged from the army in 1918 after being diagnosed with tuberculosis. These recurring bouts of illness made it difficult for the artist to paint. 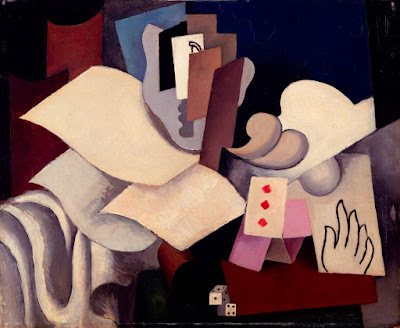 Perhaps that contributed to his turn to unalloyed realism in the paintings of his last years, The joy he had found in playing with cubism was difficult to sustain after witnessing the sufferings of soldiers and the decline of his own body. He was only 40 when he died at Grasse on the French Riviera in 1925. 1. 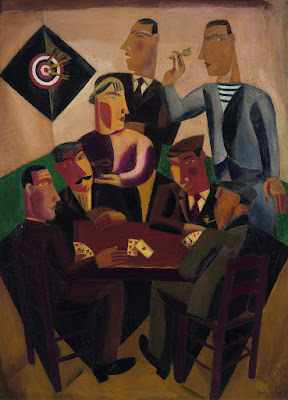 Roger de La Fresnaye - The Prestidigitator, c.1921, Pompidou Center, Paris. 2. Roger de La Fresnaye - The Conquest of the Air, 1913, Pompidou Center, Paris. 2. Roger de La Fresnaye - The Man Who Waits or The Architect, c.1913, Pompidou Center. I Say it's a Poodle ! At the time William Baziotes painted Shadow in 1951 he was moving away from applying paint to canvas by brush and its visible strokes as building blocks of the picture. What gives an image like Shadow its ephemeral quality is the way Baziotes applied the paint by rubbing it into the canvas, thereby making the colors seem to emanate from the canvas itself, almost shimmering in an illusion movement. Evoking dream-like states in the mind of the viewer was also the business of French Symbolist poetry and Surrealism, two of Baziotes' interests/ Alfred H. Barr coined the term biomorphism for such works in MoMA's collection by Joan Miro and Isamu Noguchi Simply put, biomorphism as an abstract style that contains traces of organic forms drawn from nature. In the years following World War II Baziotes often displayed his work work with the Abstract Expressionists in New York; the difference was that Baziotes was not so eager to deny other visual elements in his work as his friends were. It has taken some time for critics to become comfortable with the landscape elements in Helen Frankenthaler's work, for instance. Unlike Frankenthaler (1928-2011) whose career was long, Baziotes, born in 1912, died from lung cancer at the age of fifty in 1963. His most famous picture, painted in 1952, is The Flesh Easters in the collection of the Metropolitan Museum of Art. Here his compelling interest in surrealism is visible in the wavy forms merging with an apparently human head. 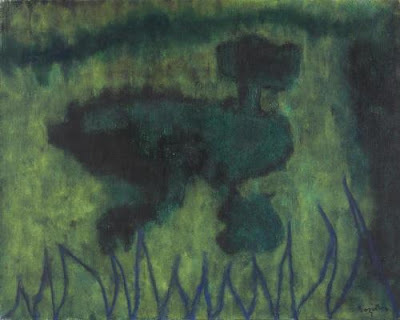 Image: William Baziotes - Shadow, 1951, Munson-Williams-Proctor Art Institute, Utica. When Vincent Van Gogh arrived in Paris in March, 1886 it was for the homeliest of reasons. Too poor to pay the rent in Antwerp, he moved in with his brother Theo who was already working for the respected art dealer Goupil et Cie and living in Montmartre, the artists' quarter of the city and a gathering place for all things avant-garde. Looking back on his fortuitous move from the summer of 1887, Vincent wrote to a friend, " In Antwerp I did not even know what the Impressionists were. " What Van Gogh took away from that encounter was a palette of bright colors; gone were the earthy tones and leaden skies of Holland and Belgium. The influence of Japanese prints, so popular among the artists of Montmartre that the craze had its own name - Japomisme - has been noted in several subsequent paintings by Van Gogh. Here we could point to the six butterflies whose iridescent red and white wings fluttering in the grasses evoke the sinuous prehensile movements of Japanese Koi fish in ukiyo-e prints . What is also striking about Coin de jardin avec papillons is the influence of photography, for long a taboo subject according to art historians and yet too obvious to ignore. Here we have a garden seen in close-up, with no horizon line for reference, a liberty the camera had made palatable to the eye. Landscape was originally used as a backdrop for religious paintings during the Medieval and Renaissance periods; its contemporary appearance (for the time) adding weight to the didactic messages portrayed by the Biblical personages. Gradually emerging as a separate genre, landscape was viewed in panorama until the camera and then the microscope opened up unexamined micro-views by closing in. This garden in suburban Asnieres was then a newly popular Sunday destination for Parisians in search of refreshment after the six day work week. At the end of this auspicious summer Van Gogh headed south to Arles and to the intense creativity and the depths of misery that are what we think of when we think of Van Gogh. The gardens the artist painted at St. Remy, where he was confined to an asylum after a nervous breakdown in 1888 look feverish by comparison; the colors under the Mediterranean light are new but the lines are the lines Van Gogh learned to use in Paris, in the colors of the Impressionists. "Orsay Through the Eyes of Julian Schnabel" is an exhibition that opened October 10, 2018 and will remain on view until January 13, 2019 at the Musee d'Orsay in Paris. This is the French museum's first invitation to a living artist to create a scenario demonstrating continuities between some of their works with thirteen of his own contemporary paintings. The Brooklyn-born Schnabel, who is also filmmaker (he directed The Diving Bell and the Butterfly in 2007) has a new film on the life of Vincent Van Gogh titled At Eternity's Gate being released to coincide with the exhibition. 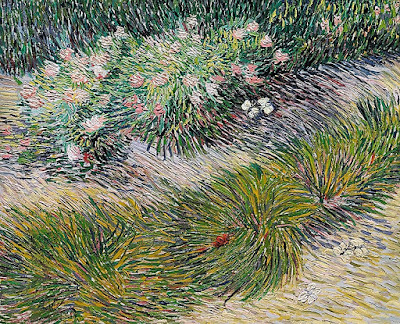 Coin de jardin avec papillons became part of the Van Gogh family collection after the artist's death, cared for by his sister-in-law, Theo's wife Jo Bongor and then was owned by journalist Joseph Reinach, steadfast defender of Alfred Dreyfus. 1. Vincent Van Gogh - Coin de jardin avec papillons (A corner of the garden with butterflies), 1887, private collection, courtesy of Christies Ltd which will offer the work for sale on November 11 in New York City. 2. Julian Schnabel - Rose Painting - Near Van Gogh's Grave XVII, 2007, Julian Schnabel Studio, courtesy of Musee d'Orsay. "I would not touch the sky with both hands." - Sappho, as translated from the Greek by Anne Carson in If Not, Winter: Fragment of Sappho, New York: Alfred A, Knopf: 2002. She gazes at us straight on, neither coy nor shy. This is not the studied indirection we are accustomed to in statues from ancient Greece, the figures often seeming to gaze inward or at a world they alone can see. Her bearing is regal, displaying her robe striped with meanders on a field of rosettes, indicators of her family's high status. 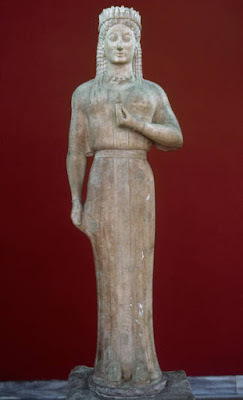 Because the base she once stood on was found in a church nearby we know that her name was Phrasikleia, that she was created by the sculptor Aristion of Paros ("Aristion of Paros made me") between 550-540 BCE, and that she died a young unmarred woman. Even well-born women led constricted lives, not welcome in the public sphere, they were confined to child-bearing and wool-spinning. They did eat better food than slaves, though. On May 18, 1972, in a field at Merenta in Attica, a kore (a young maiden, an unmarried woman) was unearthed from a shallow grave where she had been buried since the 6th century BCE. Next to her was her brother, a kouros. The most famous excavation of kourais was made on the Acropolis at Athens in the 1880s. Kourais had one foot in the world and the other pointed toward the gods. Originally created as votive offerings to goddesses in worship and supplication, the kourais gradually developed an aura of what we now call conspicuous consumption, their elaborate robes attesting to the status of their families. The pink caste to the figure of Phrasikleia in the photograph is not due to the red backdrop but rather is attributed to the red polychrome with which the figure was originally painted. It was the classicist Vincenz Brinkmann and his wife art historian/archaeologist Ukruke Koch-Brinkmann who worked to reconstruct the original colors used in Greek and Roman sculptures that has helped to alter our perception of an antique world pervaded by whiteness, in more ways than one. Change can be jarring, as witness the comment of another art historian, Fabio Barry, who complained that a full-color recreation of a statue of Emperor Augustus in the Vatican Museum looked like nothing so much as "a cross-dresser trying to hail a taxi." While Phrasikleia's colors have been bleached by time her gaze retains its dazzling directness. Phrasikleia Kore - c.550-540 BCE, photograph courtesy of National Archaeological Museum, Athens. You, good-for-nothing snail, you who don't love me." - excerpt from "Still?" by Wassily Kandinsky, translated by Elizabeth R. Napier from Sounds, New Haven, Yale University Press: 1981. What do we have here in Gustave de Smet's painting The Inn? 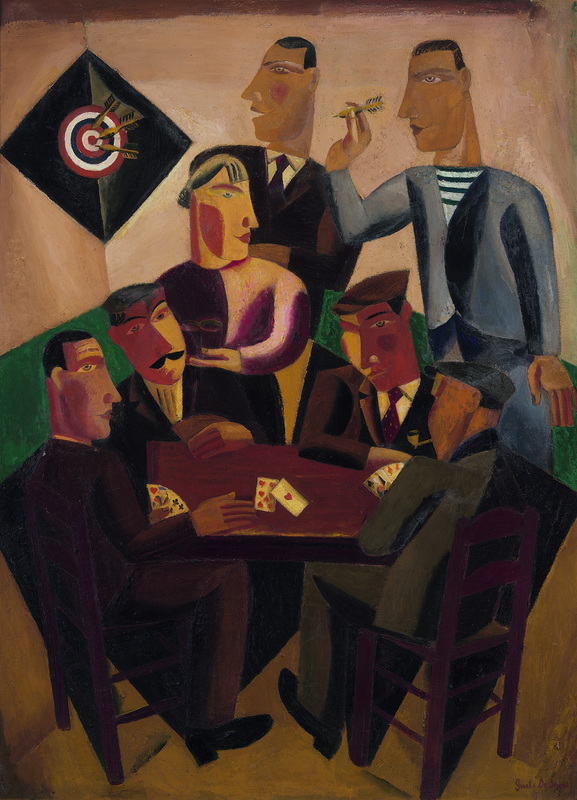 Superficially, an ordinary scene of evening conviviality: a quartet of men playing cards, a barmaid standing by with a round of drinks, and two men playing darts. But the spaces between these characters have gone missing, leading to an overall sense of claustrophobia, intensified by the proportions of the canvas, imparting a sinister potential to the dart-throwers. Surely they aim too close for the the comfort of their fellows, a suggestion of misgivings about where modernity was taking the world. By the time De Smet painted The Inn in 1924, he had begun incorporating elements of Cubism into the faces of his characters, their stylized flatness mask-like. Still we search them for hints of emotion. The brilliant colors used by the Fauves ("wild beasts" so-called, by their critics) took on darker hues in the Expressionist paintings of the 1920s. Like three horsemen of the Apocalypse, Darwin, Marx, and Nietzsche trampled the values that had been pillars underpinning European civilization to a heap of rubble at the turn of the last century. Modern times always seems unprecedented to those living through them. For some though, the disarray offered a springboard to the new. Expressionism in art, in music, and in literature, was heightened sensitivity to the speed and uncertainty of life. Are we really moving forward or just running amok, artists wondered. Gustave de Smet (1877-1943) was a Belgian painter who was exposed to art-making in the studio of his father Jules, a set director. During World War I, de Smet fled to Belgium, among the first of many moves in his peripatetic career. Social scenes, such as fairs and playgrounds, were his favorite theme. Gustave de Smet - De Herberg (The Inn) 1924, De Bode Collection, Ghent, Belgium. When they appear in August, dahlias are like many-petaled suns: large, round, and radiating fructiferous color. This is no flight of fancy; for centuries Mexicans (the dahlia's native country) have eaten its boiled stalks. we see a sophisticated harmony of color and movement. 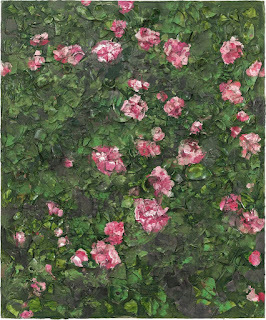 The petals move like pinwheels in motion and, although there is no objective reason for the colored stripes that bend up toward the flowers, they suggest the artist's delight in paint. Irma Stern was born in the Transvaal of South Africa, the daughter of German Jewish parents who had emigrated to the Cape Colony before her birth in 1894. When her father was interned during the Boer War, Irma was taken to Germany by her mother Hennie to be near relatives, to return after the war's end. At nineteen Irma Stern once again traveled to Germany to enroll at art school in Weimar but, becoming disillusioned with the teachers, she transferred to a studio in Berlin. Only when she met the expressionist painter Max Pechstein did she find the best teacher for her. By the time she returned home to South Africa at age twenty-five, she had already received her first solo exhibition in Berlin (1919). Her first exhibition in Cape Town the next year revealed how different and provincial that city was. Instead of praise, Stern's work was ridiculed mercilessly, "Insults to human intelligence" and "Lunatic Inspirations" being just two of the denunciations that appeared in print. There was even a police investigation of what some perceived as obscenity. Another sign of the provincial sense of inferiority was the volte face by critics and the public that followed in the wake of Stern's successful exhibitions in England, Germany, and France where Stern was awarded the Prix d'Honneur at Bordeaux in 1927. Two years later she was chosen to represent South Africa at London's Empire Art Exhibition. She went on to represent South Africa at four Venice Biennials in the 1950s. By the time Stern died in 1966 she had more than one hundred exhibitions to her credit. The Irma Stern Museum is located on the campus of the University of Cape Town. 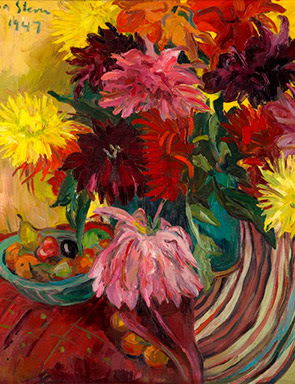 Irma Stern, Dahlias, 1947, private collection, courtesy of Strauss & Company, Cape Town. "When the skies are going to fall, fall they will..."
She stares out at us holding up the weight of ages. At first glance, it seems odd to describe sculpture as consisting of two and three dimensions at the same time but looking at the work of Ruby Sky Stiler, it becomes clear that this is exactly her intention. Stiler's intentions are grand and so are her models. Th formal feeling in Stiler's figures evokes the caryatids, those stoic female figures who perform in perpetuity their hieratic functions on the Acropolis. Stiler often makes use of classical models whose origins are obscure but usually attributed to the sculptors in early Greek states. A fortuitous find at a yard sale, Ernest Arthur Gardener's 1905 classic A Handbook of Ancient Greek Sculpture, and a subsequent visit to the ruins of Pompeii in Naples a few years, led to Bust of a Woman, confronting us with familiar forms and distant meanings. Or, as Stiler titled her 2017, exhibition Nicelle Beauchene Gallery, Inherited and Borrowed Types. Her iconography also incorporates feminist imagery (the curved arm raised as if in a dance). You can see the influence of Louise Bourgeois in the fractured perspectives of Stiler's figures. She often works in bas relief, the low relief sculpture often incorporated into the facades of buildings and also a strong feature of Native American pottery. Ruby Sky Stiler was born in 1979 in Portland, Maine, studied art at the Rhode Island School of Design and Yale University. At present she lives in Brooklyn Museum. Stiler's work was included in the inaugural exhibition at the Wellin Museum of Art in 2012 on the occasion of the two hundredth anniversary of the college's founding. Her work is on display at the Socrates Sculpture Park in Neew York City. Image: Ruby Sky Stiler - Bust of a Woman, 2014, glass, fiber, reinforced concrete, Nicelle Beachine Gallery, NYC. Clarice Lispector (1920-1977) was a writer whose work is as central to the literature of Brazil as Borges to Argentina or Garcia Marquez to Colombia. Now, thanks to new translations of her books and a biography, Clarice Lispector we can read her in English. Lispector's writing can be difficult to describe. She draws on Kabbalah and mysticism, more generally, and its volatility is sometimes surreal. Elizabeth Bishop, the austere American poet who lived for decades in Brazil, was surely an odd match when she chose to translate five of Lispector's stories into English in 1963. Two of them - The Hen and The Smallest Woman in the World were published in Kenyon Review in 1964. Helene Cixous, the French philosopher, says that Lispector's keen interest in Kabbalah and mysticism made her what Kafka would have been if he had been a woman, and "if Rilke had been a Jewish Brazilian born in the Ukraine. If Rimbaud had been a mother, if he had reached the age of fifty. If Heidegger could have ceased being German." Lispector often despaired but she never stopped searching for the God she believed had abandoned her. Her first novel Near to the Wild Heart was published in 1943 when Lispector was a twenty-three year old university student; her last novel The Hour of the Star was published two months before her death in 1977. In between there were several novels, short story collections, children's books, and journalism written from locations in Italy, Switzerland, England, and the United States. Both her sons were born abroad. Born in a shtetl in western Ukraine, Lispector was the youngest of three daughters. Mania Lispecctor, her mother, was raped during the pogroms that raged unchecked in the aftermath of the Russian Revolution of 1917. The family fled, first overland to Romania and then by sea to Brazil where Lispector's mother already had relatives living. Her health broken, Mania was paralyzed by her injuries, dying when she was only forty-two and Clarice was nine. Changing her name from Chaya to Clarice, Lispector grew up in Recife, the capital of the northeastern province of Pernambuco. 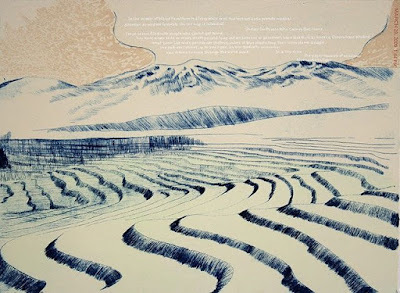 You can taste the flavor of this hard, dry region in the poems of the great Joao Cabral de Melo Neto. Born in the same year as Lispector, Cabral de Melo Neto became a diplomat, whereas Lispector married one. At twenty-three, she became a naturalized citizen of Brazil, married Maury Valente, and published her first novel Near to the Wild Heart to immediate acclaim. As the wife of a diplomat, Lispector watched the retreat of Hitler's armies from Italy in 1944 and tended to wounded Brazilian troupes in Naples, while reading Katherine Mansfield's stories (in Italian) in her spare time. Other postings to Bern, Switzerland in 1946 and England in 1949 were always interspersed with trips home to Brazil. The exception was seven years spent living in Washington, D.C. from 1952 to 1959. With such a history, death is often a presence in Lispector's stories and she imagined her own death in many of them, as in this excerpt from An Apprenticeship (1969): "She had never read dying before - what an opening she had before her." Nevertheless Lispector warned readers not to mistake her work as mere autobiography. They were, she explained, "true but invented." According to those who knew her, The Hour of the Star is the truest expression of Lispector's personality. Its protagonist Macabea, is named for a hero of early Jewish history. Born in Alagoas where Lispector's family had lived, the climate is so harsh and dry that the the local patron saint is Our Lady of the Good Death. Macabea shares her creator's fascination with the void: "Was she a saint? So it seems. She didn't know that she was meditating because she didn't know what the word meant. It seems to me that her life was one of contemplation of nothing." Macabea is an orphan who leaves home to look for work in the big city, as un-self conscious as she is unschooled. When the story begins, Macabea is working as a typist in Rio, so poor that she makes less than the minimum wage. She makes mistakes at work every day because she is shriveling from hunger yet she takes pleasure in her job and she enjoys Coca-Cola. When she acquires a boyfriend, he is a ne'er-do-well who drops her for a more affluent girl. Gloria deigns to offer Macabea advice, sending her to a psychic who assures Macabea that her life will be changed forever by this visit. Believing the fortune teller means that Jesus has finally come to take care of her, Macabea walks out the door with a smile on her face, only to be struck by a big yellow Mercedes. The Hour of the Star was published in October, 1977. Lispector died on the day before her fifty-seventh birthday in December, 1977 from an untreatable ovarian cancer. She was never informed of her diagnosis when she was admitted to the hospital in Rio. who studied in Rio de Janeiro with the ecologically-minded landscape architect Roberto Burle Marz (1909-1994). Her desire to erase the demarcation between two and three dimensional works gradually drew her from painting to sculpture. During the 1960s she took part in the Tropicalia movement of theater, art, and music, that included Caetano Veloso, Gilberto Gul, Tom Ze, and Gal Costa. Whether in combining geometry and organic forms or healing and abstraction, Clark was always searching for new combinations in her work. 1. Why This World: a Biography of Clarice Lispector by Benjamin Moser, New York, Oxford University Press: 2009. 2. Hour of the Star by Clarice Lispecotr, translated from the Portuguese by Benjamin Moser, New York, New Directions: 2011. 3. Education By Stone by Joao Cabral de Melo Neto, translated from the Portuguese by Richard Zenith, Brooklyn, Archipelago Books: 2005. And more about Clarice Lispector in translation from Three Percent. 1. Lygia Clark - Bicho (Critter) or Maquino (Machine), 1962, Museum of Fine Arts, Houston. 2. 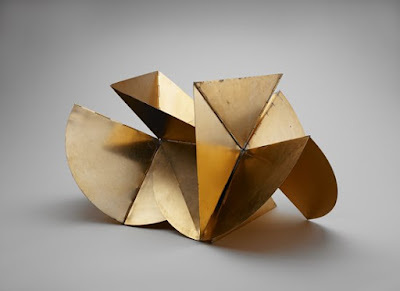 Lygia Clark - Superficie Modulada, 1956, Associacao Cultural, Rio de Janeiro. Like going the wrong way on a one way street, the paintings of Tomma Abts zigzag, make sharp turns, and seem to double on themselves, all on two dimensional canvases. Their angularity has been likened to origami and their twists and turns seem to express high torque. Abts practices what some critics refer to as geometric abstraction (think of Piet Mondrian's Broadway Boogie Woogie), opposing it to expressive abstraction in the drip paintings of Jackson Pollock, for example. At heart, geometric abstraction is an optimistic style, its belief in rationality buoyed by painters' efforts to create a truly international visual language. As so often happens, these two competing schools have much more in common than their squabbling suggests. Her paintings are all the same size: 48 cm x 36 cm (a 4 to 3 ratio). Their surfaces are painted, scraped, embellished, and polished and, although it is difficult to see in reproductions, there is an animated quality to them that may make the viewer think of Pop Art. 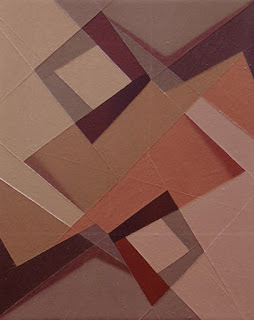 The way the artist manipulates the lines as she puts them on canvas tricky, in the way that an Escher is tricky. 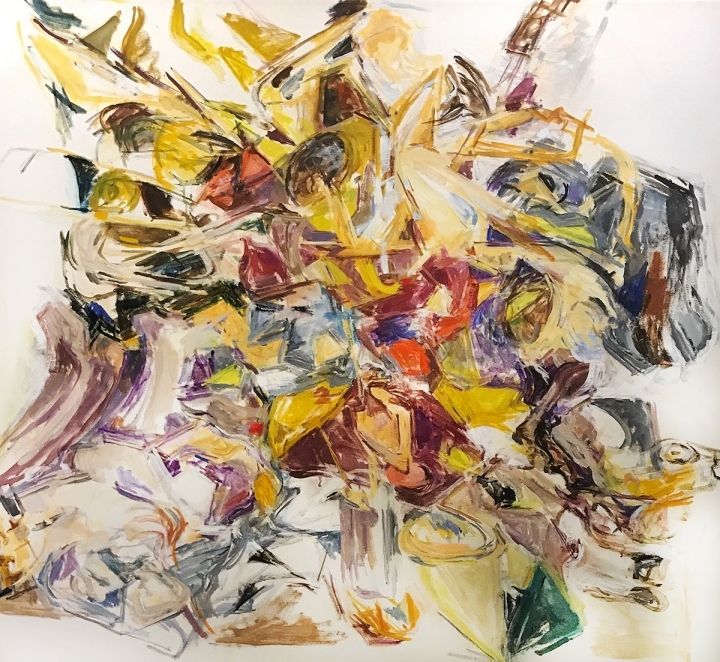 Her method has evoked unusual attempts at description: Andrian Searle, writing in The Guardian, compared an Abts painting to driving the wrong way down a one way street. The way She gives them titles that have no recognizable meaning to outsiders; perhaps given how long she labors over each one they are names, as in old friends. Sometimes the lines in an Abts painting appear to be raised above the canvas in a third dimension. The greeand yllow lines that zigzag downward in Inte look like lightening or fractured light rays. Another painting, Oke, could be music made visible,the looping curves staves weaving in and out of one another and overlapping as instruments do but words rarely can. You get to decide whether pink an d mauve or olive and spring green best represent the treble or the bass clef. 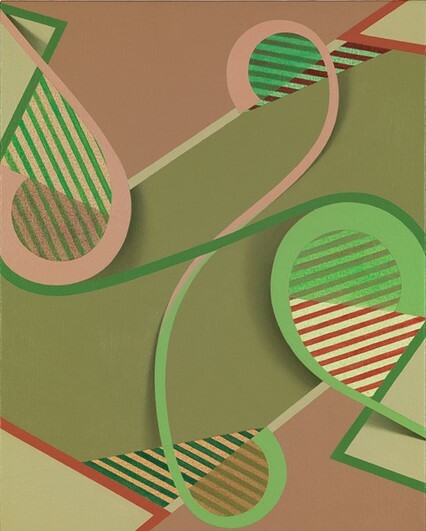 Tomma Abts was born in Germany in 1967 and attended art school in Berlin before moving to London in 1995 in search of a more stimulating artist community. She won the much sought after Turner Prize (bestowed by the Tate Gallery) in 2006. The prize, first awarded in 1984, was named for the 19th century British painter J.M.W. Turner. An exhibition of paintings by Tomma Abts is now at the Serpentine Gallery in London and will travel to the Art Institute of Chicago in October. 1. Tomma Abts - Inte, 2013, private collection, Cologne. 2. Tomma Abts - Oke, 2013, David Zwirner Gallery, NYC. 3. 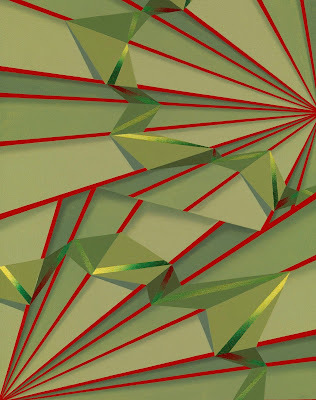 Tomma Abts - Taade, 2003, Art History Archive. Have you ever looked at a Matisse or a Derain and noticed how colors in their paintings seem to compete with each for the viewer's attention? It was for this characteristic that a critic derisively dubbed them les fauves (the wild beasts) at an exhibition in Paris in 1905. Something different is going on in the paintings of Sally Michel. Her blocks of color are definitely modern yet coexist in a state of harmony, so are her lack of conventional modeling and chiaroscuro. Even without them, figures in her paintings are lively and full of personality. Mane flying, legs practically dancing off the ground, head turned toward the young girl in the cart, Harness Racing captures a moment of shared joy in movement on a dusty circular track. Just so, we feel the Guitar Player lean into her instrument. Knowledge stored in the hand has been rehearsed in the mind. Sally Michel was born in Brooklyn in 1902 and died in Manhattan in 2003. She studied at the Art Students' League, easily becoming an accomplished painter. 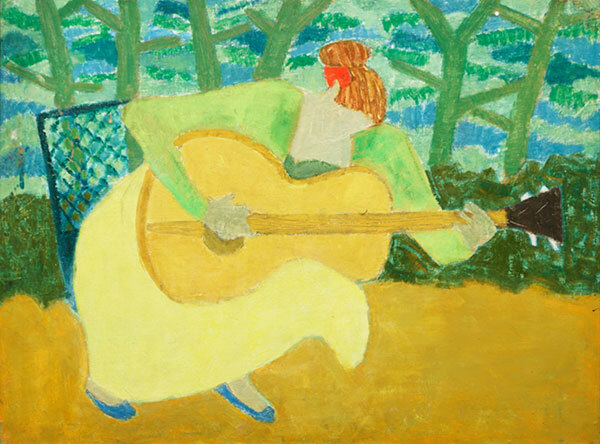 At the age of twenty-two she met Milton Avery; he was thirty-nine and also struggling to make his way as an artist. Two years later they married and Michel (she always exhibited her work under her own name) worked as an illustrator to support her husband, giving him the time and sustenance that enabled him to mature as an artist. They met in 1924 in Gloucester at a summer artists' retreat in Gloucester, Massachusetts made popular by its native Fitz Hugh Lane (1804-1865) whose luminist paintings were a revelation to mid-nineteenth century Americanartists. First Winslow Homer arrived in 1873, and then John Henry Twatchman and Childe Hassam, and by the time John Sloan arrived in 1914, he remarked, exaggerating only slightly, "There was an artist's shadows beside every cow in Gloucester, and the cows themselves were dying from eating paint rags." Nevertheless, Sloan spent his five most productive years there and convinced his friend Stuart Davis to come too. In the fall Michel returned to New York and soon Avery moved there from Hartford. Fearful that the Michels would look askance at their twenty-two year old daughter bringing home a thirty-nine year old man, Avery decided to shave a few years off his age. The two married in 1926 and soon after critics were noticing a new freshness in Avery's work, as she and her painting began to influence him. Michel was known for her optimism, her wit, and her ready laugh; it was she who introduced the element of fun into Avery's work. We know that she chose the titles for almost all of his paintings. The two often painted side by side in the living room of their apartment but Avery's increasingly public career credited him alone for the "Avery style." Without Sally Michel, Milton Avery might have continued on the conservative path he had started down, a mild version of second generation New England impressionism. Her Field in a Hilly Landscape Michel rearranges that landscape, mixing perspective illusions to create a strangely realistic yet trompe-oeil world. 1. Sally Michel - Autumn Fantasy, 1957, D. Wigmore Fine Art, NYC. 2. 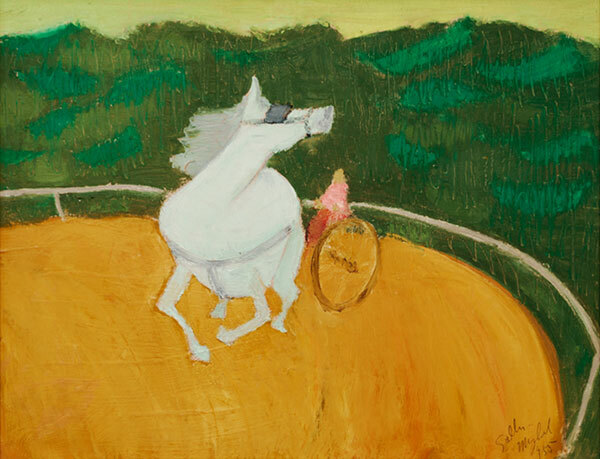 Sally Michel - Harness Racing, 1977, D. Wigmore Fine Art, NYC. 3. Sally Michel - Guitar Player, no date given, D. Wigmore Fine Art, NYC. 4. 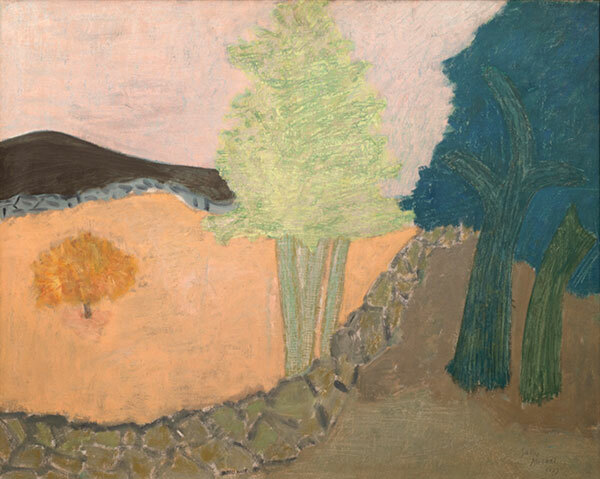 Sally Michel - Field in a Hilly Landscape, no date given, D. Wigmore Fine Art, NYC. 5. 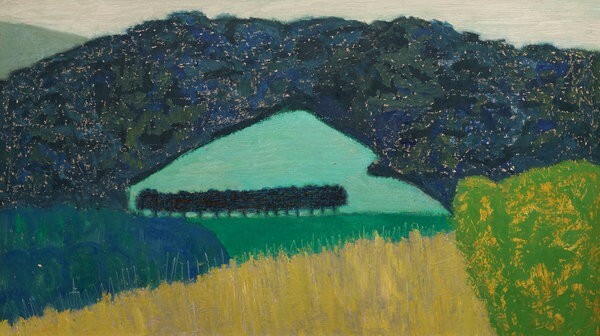 Sally Michel - Wooded Landscape, no date given, D. Wigmore Fine Art, NYC. After all the talking in the audience dies down, one can begin to make out some whispering voices from behind the screen. Then a couple of footsteps can be heard, something that is dropped on the floor, a door that slams shut. For a while there is silence, then the whispering voices can be heard again, and like this it keeps alternating between the silence and the sound of voices. When on the way home I complain how there wasn't a movie, I'm informed I lack imagination. "It isn't people when they are fictitious, who have my interest," I try to explain, but of course in vain. The one we talk to, when we talk to ourselves, always gets the last word. At the back of the store, where dusty porcelain was piled from floor to ceiling, I found a plate so deep that one day in my kitchen by accident I dropped an entire cauliflower into it, and I didn't find it again until days later,, as I, crawling on all fours on the bottom of the plate, reached the edge, where in a radiance and as far as the eye could see, hung thin, white curtains calmly waving back and forth, as if it were the room itself that was teetering from side to side. Carsten Rene Nielsen's poems take flight from his neighborhood in Aarhus, the second largest city in Denmark, located on the east coast of the Jutland peninsula. In Nielsen's giddy vision Aarhus is a place where comedic errors lie in wait, where questions go without answers, and stairways and alleys lead anywhere but to the expected terminals. Nielsen's prose poems take everyday urban places, florists, department store fitting rooms, sidewalks, and objects we take for granted such as garbage cans, shoelaces, shirts, and the daily mail and get them up and involved with humans in surprising ways. The dish may not run away with the spoon, as in the nursery rhyme, but it may entrap an unwary shopper. A little bit of fear but more magic is created. Modern, in the sense of being stripped of decoration, surreal in defying the conventional laws of physics, Nielsen's world becomes a recognizable place by the end of Household Inspections. 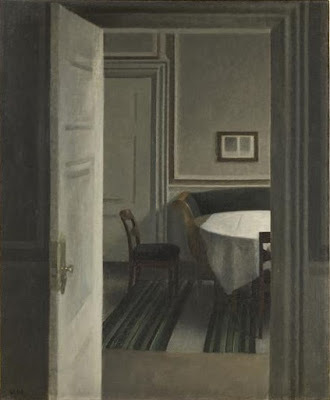 Vilhelm Hammershoi's painted world also often focuses on domestic settings. An early example, A Baker's Shop, is surely an edited version of a patisserie, its lines and neutral colors going against our expectations of plenitude. By implication the baker is an acolyte tending a floury altar to the staff of life. By contrast, during the same year Gauguin was painting bright blue trees at Arles and Van Gigh was working on two versions of his starry nights. House Inspections by Carsten Rene Nielsen, translated from the Danish by David Keplinger, Rochester NY, BOA Editions: 2011. 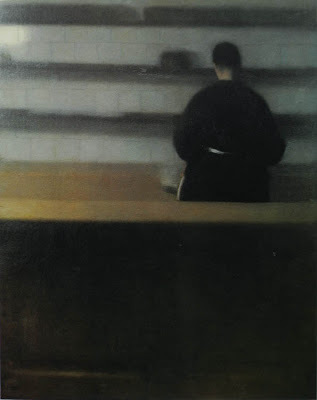 Vilhelm Hammershoi - A Baker's Shop, 1888, Copenhagen. What is it to be Danish? Has almost turned me Spanish. - excerpt from "Being Danish" by Kaj Munck (1898-1944) from A Second Book of Danish Verse, translated by Charles Wharton Stork, Freeport, NY, Books for Libraries Press: 1968. The cliche of the melancholy Danish temperament hovers over the enigmatic art of Vilhelm Hammershoi (1864-1916); his work has been compared to Shakespeare's Hamlet or a setting for an Ingmar Bergman movie. And yet it stands out in company with other art of Danish Golden Age (approximately 1830-1870), work that can be as bright and boundless as the preternaturally blue summer nights of the north. Hammershoi stood apart from other artists of his day; he chose to paint portraits only of people he knew and his palette was one of tones rather than colors. Was his art cold and repressed or tranquil and intimate? 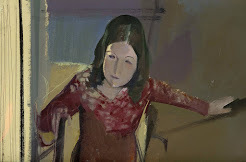 I incline to the latter interpretation but understand the impulse to try to wrest from these paintings stories, whether made-up or drawn from the artist's own life, that justify our strong responses. Surely, there must be much ado about something. In Dust Motes Dancing In Sunbeams), painted in 1900, the artist offered a bravura demonstration of visual sensation by subtracting all the furnishings from a wood-paneled room with a door leading to an interior courtyard. Even the round knob on the door is unnece In Dust Motes Dancing In Sunbeams), painted in 1900, t ssary to his aims. But oh, those shades of white, mixed with bits of color, described by a friend who saw the artist's palette as resembling "oyster shells." Photographs, on the other hand, provide evidence of the accouterments of everyday life in the Hammershoi home: paintings hang on the walls, curtains flutter at the windows, and china is laid out on the table. The Hammershois possessed some aesthetically pleasing furniture, a white Hepplewhite chair gracing several paintings. 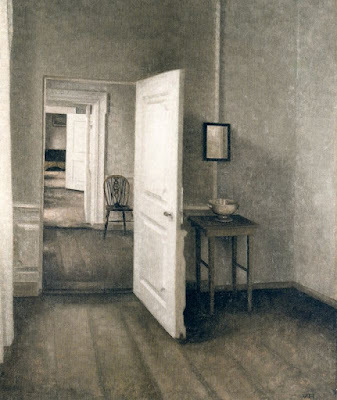 Ida Ilsted wrote to a friends that Hammershoi "had always wanted to live" in the apartment at 30 Strandgade after the couple moved there in 1898. A large apartment dating to the 17th century that connected two buildings in the old Christianhavn section of Copenhagen, 30 Strandgade comprised a series od connecting rooms that had the air of a gallery intended for art or as art itself in Hammershoi's pairings. 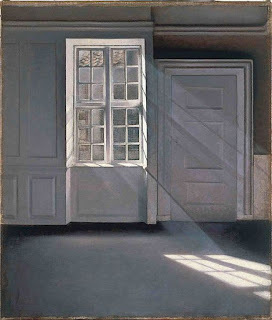 Hammershoi himself wrote in a letter "Personally I am fond of the old, of old houses, old furniture, of that quite special mood that these things possess." No surprise then that Hammershoi was attracted to archaic Greek sculpture that he painted in the museums of Paris and Rome that the couple saw on their honeymoon tour. Hammershoi was fortunate in being supported by wealthy patrons who eagerly snatched up his domestic interiors and his scenes of old Christianhavn. Carl Jacobsen was a brewer whose family business underwrote the establishment of the Ny Carlsberg Glyptotek to house the family collections, and tobacco manufacturer Heinrich Hirschsprung donated his collection to the state which built it a museum in Copenhagen finished in 1911. Ironically perhaps, Hammershoi, a smoker, died of throat cancer five years later. 1. Vilhelm Hammershoi - Interior, Strandgade 25, 1914, 85 x 70.5 cm, Ordrupgaard, Copenhagen. 2. 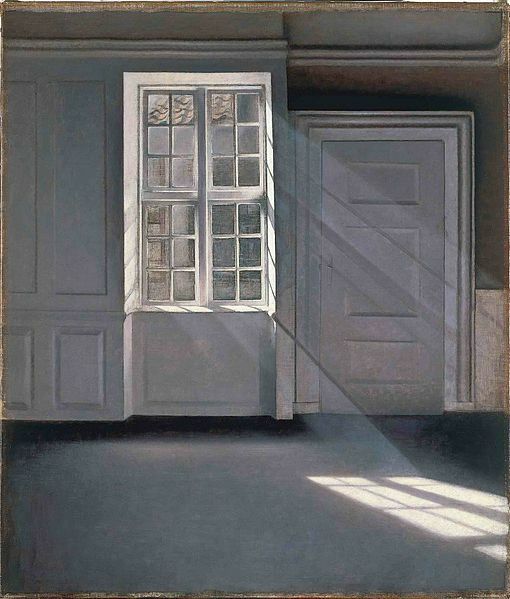 Vilhlelm Hammershoi - Dust Moats Dancing in The Sunbeams, 1900, 23.2. Ordruppgaard, Copenhagen. 3. Vilhelm Hammershoi - Interior, Strandgade 30, March 1904, 55.5x 460.4 cm, Musee d'Orsay, Paris. This is a strange night world where seabirds fly and the docks and beaches are so many stripes illuminated by a mysterious source, backlit like a Hollywood movie yet painted a century and more ago by Leon Spilliaert of Ostend (Ostende in French, Oostende in Flemish), an important distinction in his native West Flanders. Similarly poet Laure-Anne Bosselaar paints in words a visual equivalent to Spilliaert's world. For both, the night and the sea become seemingly fathomless and static, unlike the usual characteristics of night and sea. Both Bosselaar and Spilliaert are true Oostendenaars, fluent in both Flemish and French, their imaginary worlds are split at the root, as Luc Sante described it in The Factory of Facts, "Belgian art, the id of the nation, manages to be extravagant and tight-lipped at once..."
In art the beach at Ostend is as familiar to Belgians as the beaches of Normandy are to lovers of French Impressionist painting and for the same reason: during the late 19th century swimming and sun-bathing became popular pastimes for a growing middle class with newly acquired leisure. Ideas, applied indiscriminately as they almost always eventually are, prompt a reaction. As the German philosopher Hegel put it: thesis, antithesis, synthesis. Well, maybe the first two but in art synthesis is no sure thing. At the end of the 19th century European arts were marked by a fascination with irrationality in response to philosophical positivism with its claims to explain every phenomenon by scientific and rational means. In Brussels and in Paris, Leon Spilliaert, painter, frequented literary circles. He particularly admired the French-speaking Belgian poet Emile Verhaeren. Verhaeren was so highly regarded that he was considered for the Nobel Literature Prize but considered a long shot after his countryman Maurce Maeterlinck won the prize in 1911. Although it is difficult to pin his poetry in modern terms, Verhaeren was close to the art of Fernand Khnopff and the expressionist James Ensor, two Belgian painters whose works he analyzed. The Belgian poet Laure Anne Bosselaar grew up in Flanders,in Bruges and Antwerp; her native tongue is Flemish. She worked for radio and television stations in Belgium and in Luxembourg before moving to the United States in 1987. She has taught French poetry and published a collection of her own French poems, Artemis. Widow of a fellow poet, editor, and translator Kurt Brown, Bosselaar currently lives in Santa Barbara, CA. The Factory of Facts by Luc Sante, New York, Random House: 1998. Leon Spilliaert (1881-1946) - La femme sur la digue (The Woman on the Sea Wall), 1907, Royal Museum of Fine Arts, Brussels.